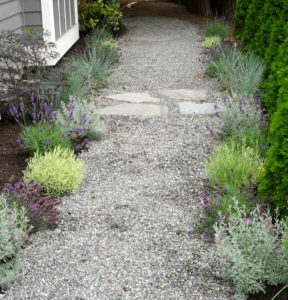 Lavender and other drought-tolerant plants create a casual border. A garden in the Greenlake neighbor in Seattle. While we might think of Lavender as a common plant, it has some uncommon uses for landscaping. A little background: Lavendula is the Latin genus referring to Lavender. There are about 39 recognized species of the Lavender plant. Countless variations are available as a result of cross-pollination of those species. In other words there are many, many Lavender to choose from for your garden. Lavender makes great informal borders (not hedges) that can be shaped as needed. Drifts created with like varieties look amazing. Or you can put together a collection of special varieties for an easy-going garden tapestry. Of course, Lavender is a standby for container arrangements with other sun-loving plants, annuals or herbs. In summer, Lavender flowers attract lots of happy honeybees—so planting Lavender is a great way to support our threatened communities of bees. Unlike the aggressive wasps and hornets that come to crash your outdoor picnics, honeybees are peaceful and will sting only if they are startled by rapid movements. Bees keep to themselves and have no interest in our foods. You can happily work among the bees if you are trimming your Lavender on a sunny afternoon. Note that Lavender is a great drought-tolerant plant and thus perfect for any waterwise and/or sustainable landscape. In Pacific Northwest gardens, location is key. Lavender needs full sun and good drainage. Once well rooted, Lavender rarely needs supplemental water and is not picky about soil conditions. In fact, rich, moist soils may cause misshapen plants with few flowers and leggy growth. Lavender does not need fertilizer, either. Nutrient-rich soils may cause rapid, weak growth. If you are looking for a tidy appearance, consider the dwarf varieties of Lavender (less than 18″ wide at maturity). They stay compact, making them perfect for city gardens that might be overwhelmed by full-size varieties that can reach four feet across. Wee One Dwarf English Lavender (Lavendula angustifolia ‘Wee One’)—A compact plant that grows only 12″ high and sports an abundance of blue flower spikes. Thumbelina Leigh Dwarf English Lavender (Lavendula angustifolia ‘Thumbelina Leigh’)—A robust grower to 15″ high with plump lavender-blue flowers and a strong, sweet fragrance. Lusko’s Dwarf Spanish Lavender (Lavendula stoechas ‘Lusko’s Dwarf’)—Grows to only 12″ with fragrant foliage and thick, deep lavender-purple flowers. Want to do something special with Lavender or other drought-tolerant plants in your landscaping? We can help. To learn more about garden planning, landscape design and successful plants for your garden, contact us. Get quick tips for planning your garden or landscaping design project.